News, photos, videos and more about football hooliganism in the Czech Republic. 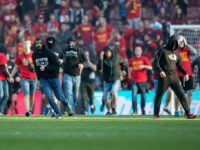 Dozens of angry Sparta Prague fans stormed the pitch following Sunday's 2-0 defeat to Slavia Prague in the Prague derby. Baník Ostrava's match at home to SFC Opava was suspended for seven minutes on Wednesday after home fans invaded the pitch and tried to attack away fans.